Today is voting day in the EU Treaty Referendum. For the last month or so we have been deafened by conflicting voices telling us what they think we should do. I am not going to rehash any of the debates (although most of them descended into shouting matches) but there is one thing that has irked me in a big way from the beginning of this campaign. And oddly enough it was exactly the same thing that irked me the last time we voted (the General Election 2011) and that thing is ENDA KENNY. I have nothing against the man personally. I do think he is a good person with his heart in the right place. But he is a weak leader – something I feared over a year ago when my vote, along with an avalanche of others, propelled him and his party into government with Labour. After 4 years of brutal recession Ireland continues to struggle economically. That sentence doesn’t however convey the very real suffering of many people in this country. A fact that was brought into sharp focus this week with an excellent, if very depressing programme on RTE 1 called Life and Debt (you can watch it back on the RTE Player here). This programme portrayed the very real and desperate nightmare many people are caught in right now. The programme made me very angry, particularly as it was broadcast in a week when once again Ireland paid €2.25bn to bondholders. According to tweeter @sebthegooner that equates to €500 for every man, woman and child in this country. That would amount to €2,000 from this house alone. We could buy our daughter the wardrobes she badly needs for her bedroom.... but for those who were featured on ‘Life and Debt’ this might buy a bit of peace of mind for a couple of weeks. If we ever needed strong leadership we need it now, which brings me neatly back to our Enda. Once again he refused to go into TV3 or any other studio to debate the issues around the EU Treaty. Bear in mind we pay this man €200,000 a year to lead the country. The arrogance is breathtaking. But it is more serious that just giving a two fingers to his electorate, Enda Kenny’s refusal to debate live on air, his obvious fear of conflict or being seen to lose clearly makes him unsuitable for the high office he holds. This is the man on whom we depend to negotiate our case in Europe. I despair. I really do. The clip above from last nights Channel 4 News is enough to make one cry! Here is the blog post I wrote over a year ago just prior to the General Election... the gladioli have come home to roost... or something! Where’s my voting card...... It’s going to be NO. This is a beautiful and thought provoking short film.... and it was made over a cold bright weekend in winter on Dun Laoghaire Pier... and you might recognise someone. You can listen to my piece entitled The Wrong Bus which was broadcast last Sunday on RTE Radio One's Sunday Miscellany by clicking here. I am the third contributor at about 19 minutes in. And do also listen to the beautiful piece of music played afterwards - by Paco Pena. I also contributed to Newstalk's 'Talking Point' with Sarah Carey which was broadcast last Saturday. We discussed how far the state should go on legislating for good parenting. You can listen to that by clicking here. Did I mention that I love doing radio? Oh and I will also have a short radio essay on this weekend's Media Show on RTE Radio One at 7.30pm on Saturday evening. I will be putting forward the case for more positive news! Yep, I love doing radio! In the recent past Ireland has proved herself to be a dangerous place for young children, particularly those who had connection with the Catholic Church and some of her deviant priests. Although the said church still seems to have a problem grasping the extent and seriousness of this issue, most of us would agree that the country is now clearly a much safer environment in which to bring up our children. And yet, in the last budget, the only senior women in the cabinet presided over the proposal to cut lone parent benefit once their youngest child reaches 7 years of age. The rationale behind this savage cut is that by then the child would be in school and the lone parent (usually a mother) should be back to work. Reality, as we know is that not only are there no jobs but there is little or no affordable childcare. The same minister has said that she will not enforce this strategy if there isn’t such childcare available... although one would then wonder why she is still insisting on a cart before horse approach. But I sense something else going on in Ireland 2012.. something which I had hoped we might have gotten rid of... and that is a cavalier attitude towards single mothers (yes I am deliberately saying mothers) and their children. I became a single mother in 1987 and back then, 25 years ago, Ireland still legally called my child ‘illegitimate’. Things have clearly improved hugely, but I am sensing that there is still a low level judgmental attitude towards single mothers. At the very least they must be seen as an easy target for this bullying approach by Government. I hope that the effective triumvirate of OPEN, Barnardos and The National Women’s Council and their campaign ‘7 Is Too Young’ is successful in drawing attention to this very unfair cut which ultimately will hurt children. This undercurrent of discrimination against single mothers was also laid bare by the recent story of the young student in Munster who was refused a place in a secondary school because she was pregnant. As far as I can remember the principal said that the school did not accept “those kinds of girls” and that his school would not “become a dumping ground for those rejected elsewhere”. Enlightened times, indeed. One wonders where the father of this child was. Did his school have the pass judgement on him before allowing him to be a student? Of course not. 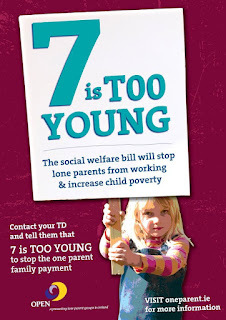 But back to the removal of the lone parent allowance when a child reaches 7 years of age which raises another issue... and possibly an even more controversial one. Should a Government have the right to force a parent of a primary school child out to work or should a parent (mother or father) have the right to stay at home and parent their child if they wish? As a stay at home mother for ten years I feel very blessed to have been given the opportunity to do so.. but I also feel (brace yourself – here’s the controversial bit) that parents should be supported if they chose that one of them will stay at home to be with their children. I am not passing judgement on any parent’s choice. I also worked when my eldest was young and only stopped when my youngest was born. I have used crèches. I know all about the juggling that working mothers have to be brilliant at. But for me being at home with my children for ten years was the most important work I have ever done. Why should not all parents have the opportunity to do likewise? I know there will be shouting about ‘who on earth is going to pay for that’ and yeah I don’t know.. But up to now we have all been content enough to allow lone parents claim a state allowance and for now, to leave that alone would be enough. In the future, when we rebuild this country, morally, economically and practically I hope that we may have politicians and opinion makers who will value the work that parents who stay at home to care for our youngest citizens do.